The Tax tab shows either a CGT (Capital Gains Tax) report or Dividend tax report. From here you can click the pale green Tax button. 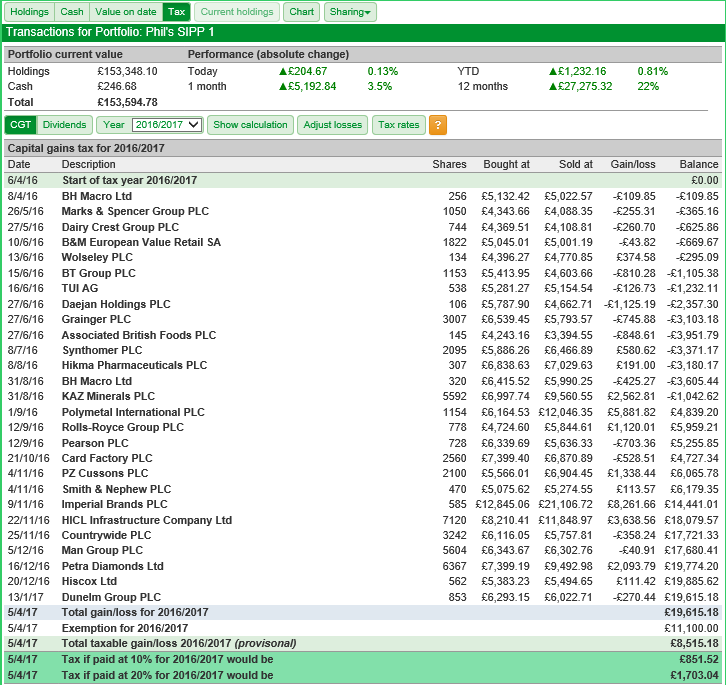 You can switch between these two views using the pale green CGT and Dividends buttons that are situated just above the tax report table. SharePad's Capital Gains Tax report is designed to work for every tax year since the introduction of the current calculation rules in 2008. 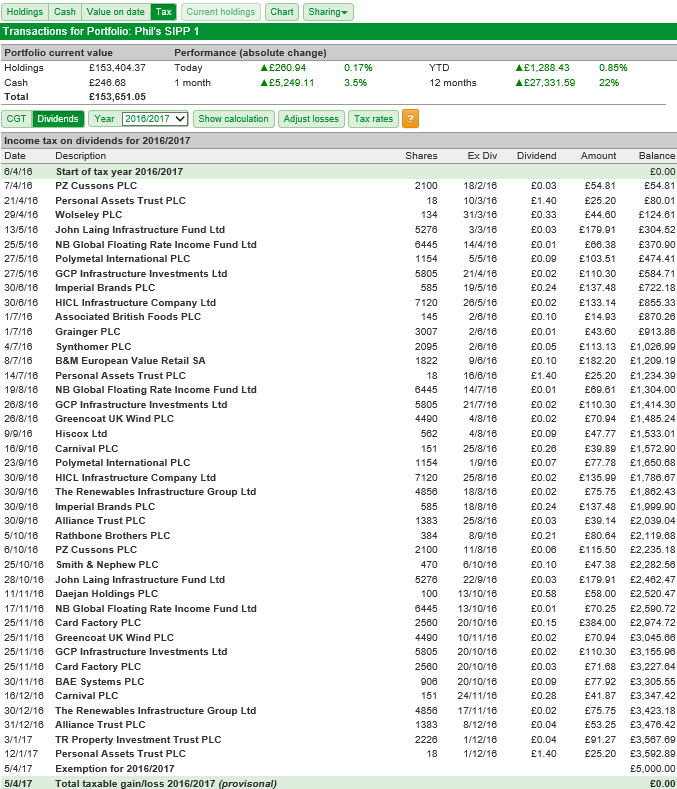 It is possible to see a breakdown of the CGT calculations used by SharePad when calculating the Capital Gains of your portfolio. To do this, you can click on the pale green Show calculation button. Indicates an entry purely for information. This will be a purchase of shares that is subsequently matched against a disposal or added to a section 104 holding. 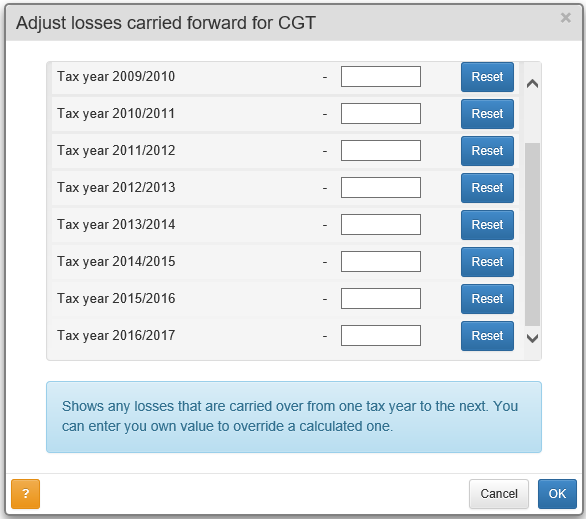 Indicates an error that will probably mean the CGT calculation is wrong. e.g. a disposal with no matching purchase. Will appear at the start of the 2008/2009 tax year if you haven't done a manual adjustment for any losses, to remind you that it might be required. To the right of the Show calculation button is the pale green Adjust losses button. This allows you to enter a loss that is different to that calculated by SharePad. The blue Reset button will change the figure back to the one originally calculated by SharePad. The pale green Tax rates button shows you the tax rates year on year since 1990. As of April 2016, the Dividend Tax Credit was replaced by the tax-free Dividend Allowance. The Dividend Allowance means that you do not have to pay tax on the first £5,000 of dividend income; no matter what non-dividend income you have. The headline rates of dividend tax are also changed. 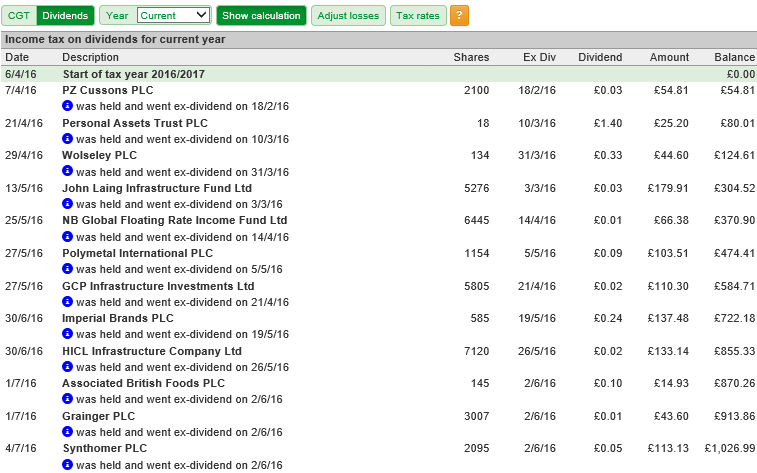 To assist you with this, SharePad's dividend tax report shows the dividend income you have accrued in a given tax year and the expected tax required to be paid on that income. As with the CGT tax report, the selected tax year can be changed. However, for years prior to 2016/2017, it does not attempt to calculate the tax liability for that year. 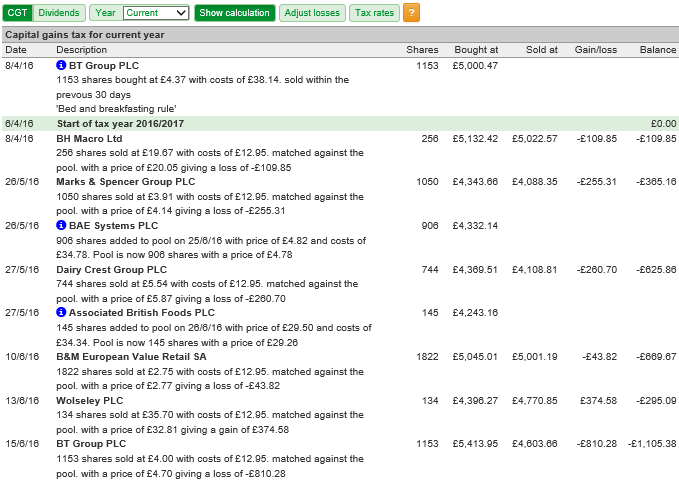 If you click on Show calculation, then the ex-div date of the dividend payments is added to the report. Note: whilst every attempt is made to make sure the calculations shown on the Tax view are accurate, it is your responsibility to check that the CGT calculations are correct before submitting them as part of a tax return. 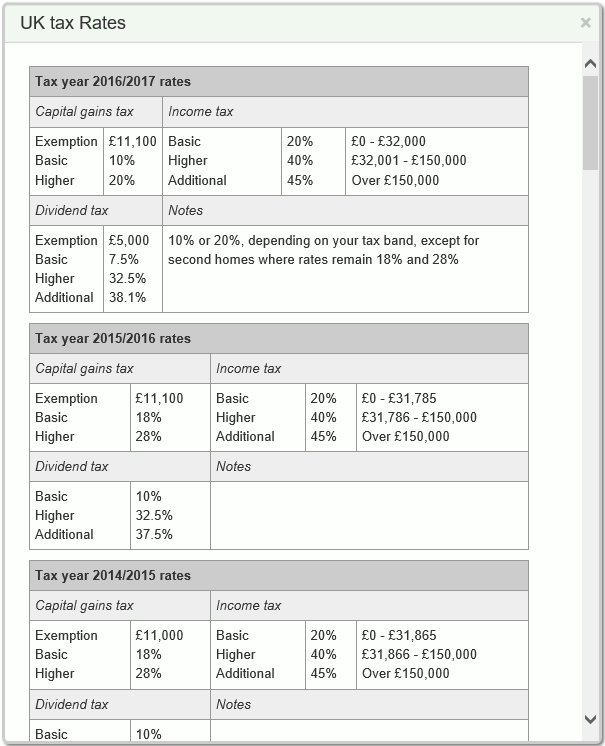 See the UK Governments Capital Gains Tax rules for more information.